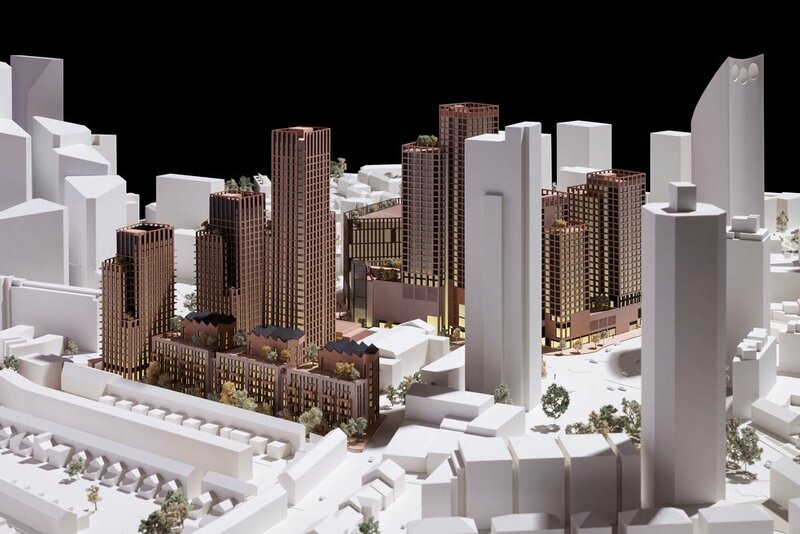 Developer Delancey has finally submitted its application for the redevelopment of the Elephant & Castle shopping centre and London College of Communication campus. It will be a mixed use development of shops, offices, homes and campus facilities. It will also provide a new entrance and ticket-hall for the Northern Line tube station. According to the affordable housing statement all of the proposed 979 residential units will be for rent, none for sale. There will be 35% affordable housing, but none of it will be social rented or part-buy/part-rent. Instead the affordable housing will be something called ‘Dicounted Market Rent’ (DMR), let at up to 80% market rent, but supposedly at a ‘blended percentage’ of 57% market rent. The application promises that at least 40% of the affordable housing will be let at or below the new London Living Rent, which would currently equate to around £1000pcm for a 1-bed flat at the Elephant. The affordable housing tenants would be on 3-year assured short-hold tenancies, not on assured tenancies with no time limit, as issued by housing associations. The affordable housing will not be let or managed by a housing association, as is usual, but will be privately owned by Qatari Diar and Delancey’s tax-avoiding offshore investment fund DV4. The Elephant and Castle shopping centre is currently owned by one of the fund’s shell companies registered in the British Virgin Islands and whose directors are registered in Bermuda and Kuwait. As expected the shopping centre is to be demolished and there will be no room for most of the existing retailers. Delancey’s planning statement contends that ‘it is recognised that some existing retailers in the area are benefitting from disproportionately low levels of rent…‘ and concludes that ‘it may not be financially viable for them to survvive in the area in the longer term’. Delancey offers a ‘relocation strategy’, but says that it’s only on condition of being awarded planning permission and fails to provide any details of what its ‘relocation strategy’ entails. Delancey make it clear in their Affordable Housing Statement that the application has been drafted after ‘extensive discussions…with the Council…and…GLA’ (para 5.1). It is also clear that much of these discussions were about changing the affordable housing rules to allow Delancey to avoid building social rented housing. Southwark has shown its affection for so-called ‘Build to Rent’ in its recent draft of the Old Kent Rd Area Action Plan/Opportunity Area Framework and the ‘flexibility’ this allows ‘Build to Rent’ in the delivery of affordable housing is duly noted by Delancey (para 3.32). Our new London Mayor, Sadiq Khan, also reveals his entusiasm for ‘Build to Rent’ in the just issued draft Affordable Housing and Viability Supplementary Planning Guidance, so Delancey can confidently state that the Mayor’s ‘Housing SPG will likely promote the 100% discounted market rent solutions on large scale sites’. So, while this application is from Delancey, there can be little doubt it is coming forward with the blessing of both Southwark Council and the Mayor of London. None of the latest London Plan or local plan documents Delancey refers to in justification of its departures from affordable housing policy have been adopted; they are out for consultation or still to be consulted on. They all promote radical changes to affordable housing policy, changes that will exclude social rented housing from major new developments. Delancey’s application is just another step down the gentrification road. It has little in it that will help those who can only afford social rented housing; indeed it is purposely designed ot exclude them from the proposed development. The shopkeepers and small traders, many from ethnic minority backgrounds, who have worked hard to become an integral part of the community, are deemed to be ‘not financially viable …to survive’. Southwark Council and the Mayor should be telling Delancey how unacceptable this application is, not changing planning policy to ensure its success. Fill in the details below to object and let Southwark know that Delancey's planning application is unacceptable. Be sure to amend the suggested wording. You will receive a confirmation email upon submitting your objection.